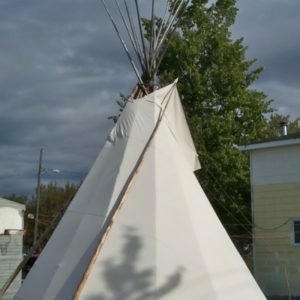 All tipi covers have triple stitched seams for better strength. Reinforcing is added to buttonholes, smoke flap, peg loops, door opening and lift pole flaps. The optional liner helps seal the bottom from critters, ads an extra layer of insulation for colder weather and most importantly help create an updraft within the tipi to help the smoke rise up and out through the smoke flaps. 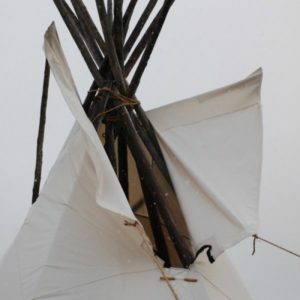 Cover rope ties the three tripod poles together and is long enough to reach the ground so that it can be staked down to the center of the tipi in the event of strong winds. 10 oz. NATURAL CANVAS is a single filled fabric that is breathable but susceptible to mildew and mold. 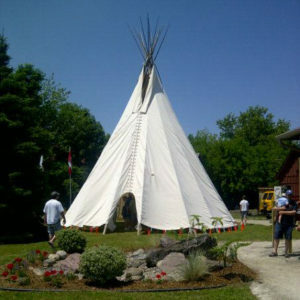 This fabric has a shrinkage factor of up to 10% that may result in reducing the tipi diameter. Made of 10.10 oz. FR canvas is mold and mildew resistant as well as water resistant. It is much denser and tougher than natural canvas and preshrunk. All seams are triple stitched. Reinforcing is added to buttonholes, smoke flap, peg loops, door opening and lift pole flaps.